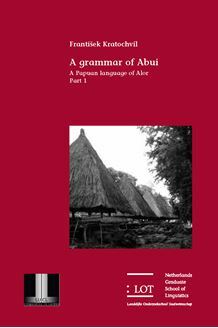 This work contains the first comprehensive description of Abui, a language of Trans New Guinea family spoken approximately by 16,000 speakers in the central part of Alor Island in Eastern Indonesia. Alor Island is the western most area where Papuan languages are spoken. It is surrounded by Austronesian languages. The description focuses on the northern dialect of Abui which is spoken in the village Takalelang. This study is based on primary data collected by the author on Alor. The grammar covers phonology, morphology and basic syntax. The appendix contains several Abui texts and wordlists. Abui is a language with a rigid word order (SOV). Abui presents a number of typologically interesting features including semantic alignment and the extensive use of generic verbs. Abui alignment system cannot be characterized as nominative accusative or ergative absolutive, but as semantically driven. Each participant is realized as either ‘actor’ or ‘undergoer’ argument, depending on its semantic properties. Abui is a language with relatively small verbal inventory. Many verbs are complex, they are derived with generic (light) verbs. Generic verbs also occur in serial verb constructions. The book has not been written against a particular theoretical background. It is of interest to scholars of both Papuan and Austronesian languages, and linguistic typology.